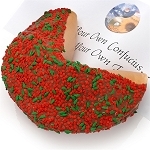 When you're looking for a gift that really makes a huge impression, you have to think big. 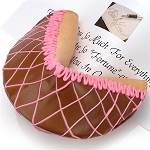 At Gift Prose, our line of Giant Fortune Cookies definitely measures up to the task in delicious fashion. 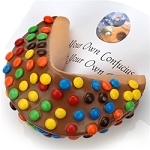 Our confectionery artisans have definitely kicked things up a few notches with these scrumptious 6" x 6" crunchy vanilla fortune cookies, coated, drizzled and decorated with yummy peanut butter, chocolate and sprinkles or a wide range of other mouth-watering toppings. 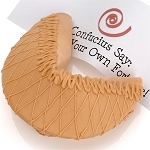 There's even a to-die-for Caramel Toffee Chocolate giant fortune cookie. 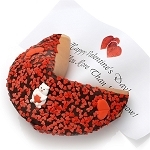 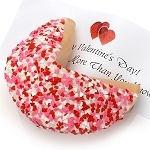 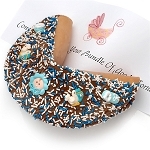 Whether it's for a special occasion, like our New Baby Boy/Girl or Valentines Day fortune cookies, or just as a tasty gift that's big enough to share, the distinctive nature of the giant fortune cookie is sure to be remembered long after the last piece has been devoured. 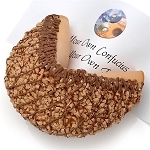 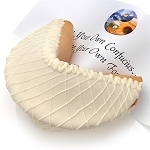 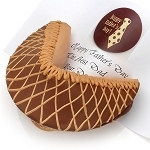 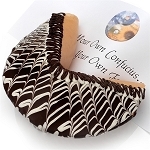 Inside each giant fortune cookie is a custom fortune message of your choosing, making this a sweet treat on several different levels. 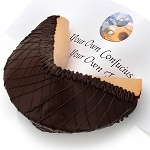 Choose your favorite style and flavor below to get started, because as Confucius says, there is no time like the present - for the perfect present.